When people talk about violence in the workplace, they don’t often think of the healthcare field. While post offices are the most stereotypical place for violent events, (lending us the phrase “going postal”) other locations that are usually considered to be more violent than hospitals include business offices and schools. As late as 2007, however, workers in health care support systems averaged an injury rate of 20 per 10,000 for assaults, and health care professionals garnered an average of 6 assaults per 10,000 people. In the general population, the rate was only 2.1 assaults per 10,000 people. And these numbers are likely low, given the underreporting of violence in the health care field. Nurses and patient care aides suffer the highest rate of violence in the health care field, with emergency department nurses experiencing the highest number of physical assaults. In one study of Minnesota nurses, emergency department nurses reported four times as many assaults as nurses on other units of the hospital. Physical effects of violence against nurses include: physical injury, disability, chronic pain, muscle tension. Often, the psychological effects of violence have much more of a lasting impact on the nurse and affect her work and stress level. Several studies have shown that loss of sleep, flashbacks, anger, sadness, frustration, anxiety, irritability, decreased feeling of safety and fear of future assaults are prevalent enough after a violent incident at work that the effects may seep into a nurse’s job performance and personal life. One study found that nurses suffer enough symptoms to meet the full criteria for a PTSD diagnosis. The employer also experiences a cost when health care violence occurs. Word gets around in the healthcare profession, and nurses do not want to work in a setting prone to workplace violence, no matter how attractive the salary. An increase in absenteeism, a high turnover rate, increased worker’s compensation, decreased morale and job dissatisfaction are some of the things that can result from workplace violence. One study on Minnesota employers found 344 nonfatal assaults cost over $5.8 million in lost wages, legal fees, insurance costs and lost fringe benefits. Nurses admit that unless they are injured, they usually carry on with work after a physical assault. Incidents are not always reported. 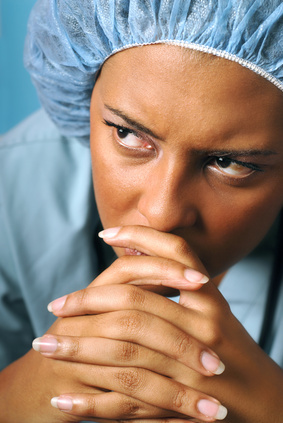 Sometimes nurses worry that a report will be ignored, or that it will be brushed off as something that is just an occupational hazard. Some feel a certain amount of responsibility for the assault — that they should have been able to prevent it. Meanwhile, hospital executives may feel reports of violence undermine patient satisfaction scores. One nurse reported needing to take a moment to compose herself and then putting her “game face back on…[to] get out there.” Nurses usually reported they were able to return to work, but had suffered either cognitive or emotional challenges in remaining focused on the job. In 2010 in an effort to improve protections for both employees and patients against health care setting violence, the Joint Commission re-released a Sentinel Event Alert on the increase in health care setting violence and set forth the steps for hospital management teams to take to improve safety standards and deal with the effects of the violence.